As you probably know, I'm FGL_Alexey at FGL, the community of indie game developers. One of my tasks is to help indie game developers to make their games better. As the developer uploads the game to us, I can give a free pre-review. I play the game, record 5-15 minutes viteo and share my impressions, as a 1st time player. Also I give my suggestions on the game's enhancement. Since 2012 I've made more than 1500 video reviews. I noticed that the often I give the same advice to the different game developers. So, I summarized my advice in the form of a conference talk. 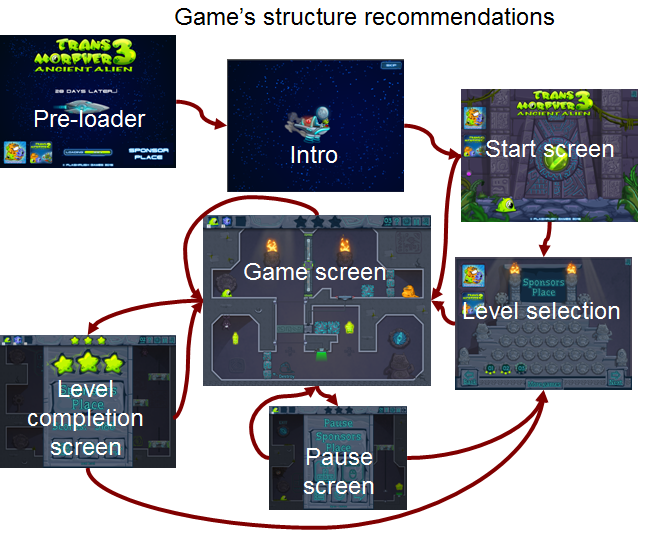 I gave this talk at Next Castle Party, also it was a part of my talk "Increasing Revenue in Indie Game Development" at Dubai World Game Summit. Now I'm going to write a series of blog posts based on my presentation slides and my new developer relation's experience. These advice can be applied to web, mobile and PC games, with some platform-related variations. 1. Make sure you have a proper game screens navigation. A pre-loader is needed to inform the player that your game is loading and not stuck. For complex games, which need significant time not only to load, but to perform some preparation calculations (objects caching, art rasterization, etc), your preloader must inform the user of this action as well. Intro screen is needed to emotionally involve the player into the game (later I'll give a separate post about emotional involvement). In some games the developers launch the Intro right after the game has been loaded, and sometimes - after the player presses "Start" in the main menu. But don't forget to let the player skip the Intro! Examples of my own games with the intro are Alien Anarchy and Save the Paintings. Start screen is the page where your Start button, logos of you or your sponsor and the the "More Games" button are located. It must be always possible to return to the Start screen from the game. You can create a separate Credits screen, which will be accessible from the Start screen, or place your info and clickable button right on the Start screen. A separate Credits screen is recommended more, because you might want to credit your sources of sound, your testers, some communities (like FGL ;) ) which members gave you valuable advice. If your game is level based, you definitely need to add a Level selection screen. Even if the levels are connected into a single story, it's always a good idea to let the player replay the previously completed episodes. Or the player might want to show a specific level to a friend. If there's a screen with a list of levels, such an opportunity will be provided. If you measure how successful the player was at the levels, show the levels' scores at this screen. So, the player might want to increase the score at the completed levels, and we get the increase of game's replayability. Also it's a good idea to award the player with various achievements. In the time of web games it was recommended to design a separate Achievements page for them, but for mobile games you can just place an Achievements button on your Start and Level selection screens, which would open the Achievements from the Google Play Services. When the player clicks "Play" button on the Start screen for the first time, you can skip the Level selection screen and open the Game screen at once. But after the player had progressed in your game, show the Level selection screen first, in case the player needs to replay some of them. The Game screen contains your game logic. In fact, if you've set up your game template properly, it's the only screen which code you need to rewrite when making a new game. Be sure to let the player exit the Game screen at any time, without loosing the game intentionally. Often this can be done by adding a Pause or Setting screen. When this screen is called, the game flow is paused. The player has the option to change some of the game settings, return to the game or exit from it. When the level is completed, one way or another, a Level completion screen must be shown. The common mistake most of the game developers make: they show the Victory screen right at the moment the last enemy is killed, when the last puzzle pattern fits its place or when the last hidden object is found. Don't do this! Instead, give the player 1-2 seconds to see the view of victorious Game screen, and only then show the page with the level results. The level completion screen should allow the player to restart the level (if the player wants it - why not?) and to proceed to the next level (if the previous level ended with a victory), or to see the list of all the levels. So, here's the basic structure. Also while designing the game's interface don't forget to let the player mute the music from any game screen. More game development advice coming soon! In the meanwhile, please, check this thread at FGL.